Isolde is the founder of Forest Kingdom and owns Shadowfrost as her exclusive Divine Arma. 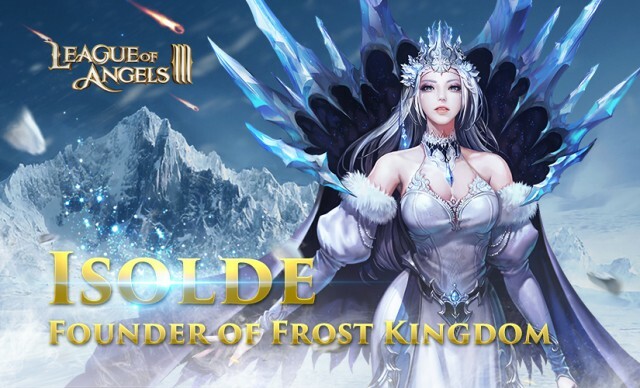 Born in Elysia and self-proclaimed as the Empress of Ice, Isolde is a pureblood angel who is magnanimous, compassionate, perseverant and being good at governing and strategizing. She has to accomplish the mission of protecting the national treasure "Eye of the Sky" and waits for its awakening. She possesses a Damage-debuffing ATK skill which enables her to launch AOE attack and freeze target at the same time, not to mention that Shadowfrost can bring a double-control effect and provide attributes bonus by 20% as her Divine Arma. Seize the chance to take Legendary+ hero into your squad! Entry: Click “Featured Hero” icon in the game interface. Frozen Edge: Deal (ATK*195%+80) damage to an enemy and reduce target’s ATK by 5% for 2 turns. Eviscerate: Attacks an enemy column, dealing (ATK*200%+90) damage and reducing enemy DEF by 10% for 2 turns. Frost Storm: Attack all enemies, causing (ATK*140%+90) Damage plus 20% to freeze target. 1. There is one Theme Hero for each “Featured Hero” event. Players will have the chance to obtain the Theme Hero Shards and the Theme Hero during the event, as well as other heroes and their shards. 2. Players can draw 1 time FOR FREE every day. Draw times will reset at midnight every day. 3. Each draw will grant 10 points. The accumulated points can be used to open Points Chests which contain the Theme Hero Shards. 4. First Drawing x1 using Diamonds each day will get half price off. 5. Drawing 5 times will guarantee Theme Hero Shards, i.e. Isolde shards. 6. The points will be reset after each event. 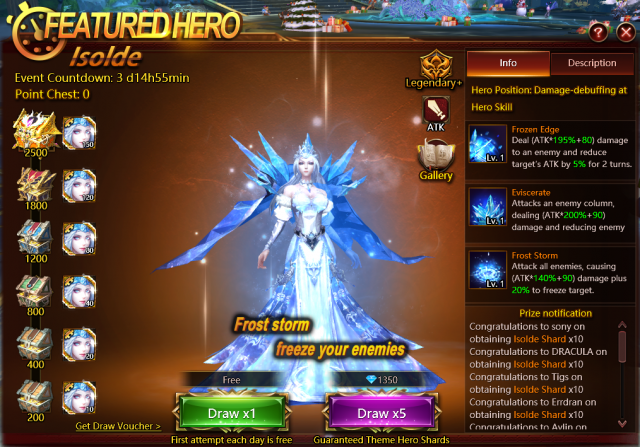 Isolde will be available in "Featured Hero" event from Dec 22nd to Dec 25th. You'd better act fast if you want to summon this powerful hero and augment her to full stars! We hope all players can build an elite squad of theirs and explore more ways to play the game! And Marvel already has Isolde. Damn it, this is unfair toward other players. Where is “Featured Hero” icon ? I can't find it I play in polish language. I have the same problem, not to find the icon. i tried the featured hero today but got different shards twice???!! Is draw available in all servers ???? 2019-4-21 02:58 GMT+8 , Processed in 0.068965 second(s), 53 queries .